A CROWD of 6,049 at the Falkirk Stadium saw a rivetting match but no goals as the hosts and Dumbarton took a point each. A CROWD of 6,049 at the Falkirk Stadium saw a rivetting match but no goals as the hosts and Dumbarton shared the spoils on a sunny but very cold afternoon. From the moment Stuart Carswell saw an early shot slide past (pictured) until the final moments when Mark Stewart's diving header went just past the post it was thrilling competitive action. The Bairns bossed most of the first half but could not score. Remarkably, they struck each post once and the woodwork twice. 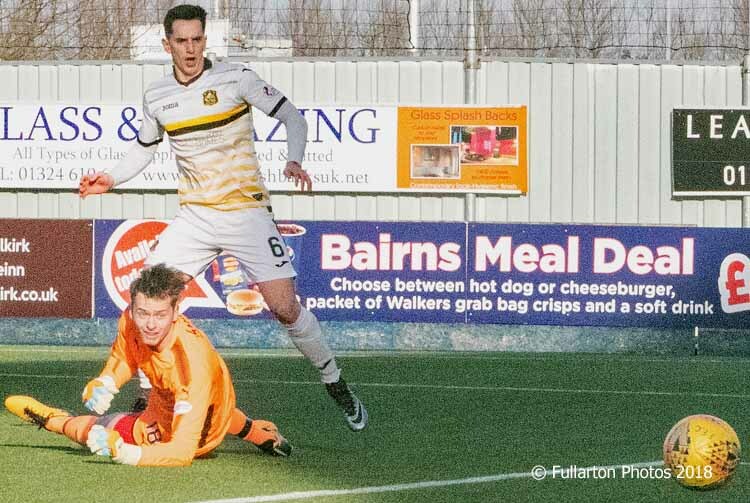 After the break Dumbarton came back into the game with more forays forward. However, they were still under pressure at the back when the Bairns broke, especially towards the conclusion of the 90 minutes. However keeper Scott Gallacher made some vital saves, and in the end it was a hard fought and well-earned point for Dumbarton.